Private eye Lew Harper returns in The Drowning Pool, a surprisingly satisfying follow-up to 1966’s Harper. Paul Newman is back as the roll-with-the-punches investigator and his real-life wife Joanne Woodward tags along for the ride. Though he’s better known for roles like Butch Cassidy and Fast Eddie Felson, Paul Newman made a big splash portraying private detective Lew Harper in the 1966 hit Harper. The star-studded adaptation of a hard-boiled Ross MacDonald novel (reviewed in this space a few weeks ago) made a tidy profit for Warner Bros, and nine years later the studio buoyantly proclaimed “Harper Days Are Here Again” as it heralded the arrival of a follow-up thriller, called The Drowning Pool. Newman was back as the charming, jaded trouble-magnet, this time appearing with his wife, Joanne Woodward, in their eighth film together. Stuart Rosenberg, who helmed Cool Hand Luke and two other Newman movies, was hired to direct. Lightning, however, did not strike twice, and The Drowning Pool drowned at the box office. Yet while this tale of blackmail, murder, greed, and twisted relationships lacks the sheen and sparkle of its more mainstream predecessor, it exudes a more authentic feel. Maybe it’s the film’s darker, dirtier tone or sharper edge. Maybe it’s because the tangled yarn is set in New Orleans instead of L.A. Maybe it’s because The Drowning Pool was produced in the more free-wheeling 1970s when moviemakers bucked established trends and began to go rogue. Or maybe it’s because Harper – and Newman – are older, wearier, less cocksure, more careful. I wasn’t a huge fan of Harper. I thought it tried too hard to evoke the classic film noirs of yore and struggled to bring 1940s sensibilities to the 1960s. The Drowning Pool wisely abandons such notions and plays it straight. It’s tough, raw, a bit sleazy, and has a stronger emotional core. Unfortunately, the story is just as complex and convoluted, but the characters seem more dimensional and therefore real. 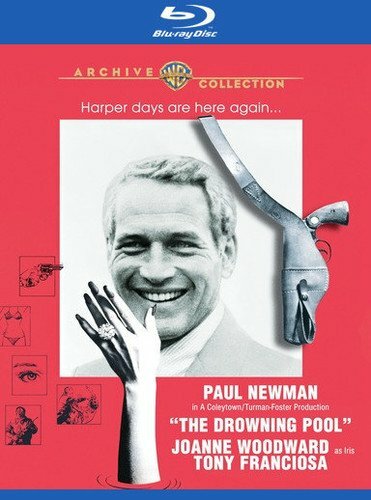 Though I certainly wouldn’t classify The Drowning Pool as a great film, I like it better than Harper. As the movie opens, Harper arrives in New Orleans at the behest of former flame Iris Devereaux (Woodward), who’s just received an alarming anonymous note claiming knowledge of her extramarital affairs. Iris fears the note’s author will expose her infidelities, which will ruin her loveless marriage and, more importantly, jeopardize her status as a wealthy matron. She hopes Harper can find the writer and diffuse the situation, but he runs into trouble almost immediately, arousing the ire of Police Chief Broussard (Tony Franciosa), the desire of Iris’s promiscuous teenage daughter Schuyler (Melanie Griffith), and the interest of a ruthless oil baron (Murray Hamilton) who hopes to enlist Harper in his nefarious plot to seize the prime real estate owned by Iris’s domineering mother-in-law, Olivia (Coral Browne). Tensions, of course, quickly rise, and soon so does the body count. Just like Harper, The Drowning Pool is filled with subplots that muddy the narrative and contribute little more than confusion. In short, there’s just too much going on. When Harper walks into the Devereaux mansion, he walks into a lion’s den and gets way more than his hands dirty. That’s to be expected, but much of the filth has little to do with the primary plot thread, which gets subjugated far too frequently in the screenplay by Tracy Keenan Wynn, Lorenzo Semple, and Walter Hill. Even the titular drowning pool is a diversion borne from a tangent. While it’s an exciting set-piece and action sequence, it’s only marginally related to the rest of the story. The Drowning Pool marks a reunion of sorts for Newman, Woodward, and Franciosa, all of whom starred together in the steamy 1958 melodrama The Long, Hot Summer. All three assert themselves well here, as does a teenage Melanie Griffith, who not only projects a potent sexuality, but also holds her own quite well in a couple of heavy dramatic scenes. Rosenberg’s taut direction neatly balances mystery, suspense, and wit, and the story throws a couple of curveballs I didn’t see coming. As neo-noirs go, The Drowning Pool doesn’t float to the top, but it does tread water, holding our interest and providing some fun thrills. If you like Harper – and more importantly, Newman – you’ll get a kick out of it. Much like Harper, The Drowning Pool looks terrific on Blu-ray. Presented in 2.40:1 widescreen, the 1080p/AVC MPEG-4 transfer from Warner Archive features excellent clarity and contrast, a lush color palette, enhanced detail levels, natural flesh tones, and revealing close-ups. Grain is evident but never overpowering, and it preserves the movie’s film-like feel while providing a gritty texture for this hard-boiled neo-noir. Shadow delineation is quite good and the source material has been nicely restored. The DTS-HD Master Audio 2.0 mono track is well balanced and clean, although some of the dialogue is a bit difficult to make out. Some of that may be due to the heavy Cajun accents a few of the actors adopt, but there’s also some muffling that muddies some of the exchanges. A wide dynamic range embraces Michael Small’s music score, which incorporates strains of the pop hit “Killing Me Softly with His Song.” Sonic accents like gunshots and fisticuffs are crisp and distinct. The only disc supplements are the movie’s original theatrical trailer and a vintage 11-minute featurette that includes comments from author Ross MacDonald, lots of behind-the-scenes footage, and a look at the New Orleans locations. A lifelong movie buff, David possesses a special fondness for classic films from Hollywood's Golden Age. He holds a degree in film history and criticism from Northwestern University, and over the past 20 years has written film-related articles for several national and regional magazines. He's been a staff writer at High-Def Digest since 2009.